Classic Car Marketing, Inc. Southern California’s premier marketing company is pleased to introduce this new listing offered for sale by one of our clients.Just reduced. This 2008 Ford GT500 Super Snake “427” edition is fully documented and is Production number 200 out of 212 produced as per the owner. 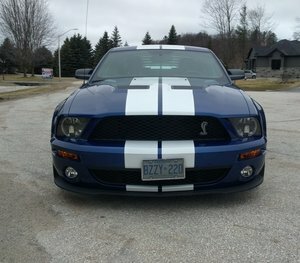 The look is off the charts with sleek body and the GT500 Premium Trim Package including unique aluminum hood that's complete with air extractors, HID headlamps, and Shelby decklid spoiler. Power for this Cobra is supplied by a 5.4 liter supercharged Shelby “427” backed by a 6-speed Tremec manual transmission. SVT tuned suspension, additional Shelby optioned 6 piston Baer racing brakes with 14 inch discs, anti-lock brakes and traction control, high performance tires sized P255/45ZR18 for the front and P285/40ZR18 for the rear, and dual tuned stainless steel X-pipe exhaust for that throaty sound we car guys love. The Shelby Interior Package includes Sport bucket seats with power 6-way driver's seat, second generation dual front airbags and side-mounted airbags for the driver and front passenger seats, air conditioning, remote keyless entry, and active anti-theft system. Another nice extra is the Shaker 1000 audio system which includes AM/FM, 6-disc CD changer and MP3 compatibility. Add to that the additional investment of $35,000 for the Shelby America conversion, and $7,000 for the “427” up-grade package and now you have one amazing Super Snake. Car is fully documented and is a very rare limited production. Offered at $108,000 OBO. For more information please visit our website at www.classiccarmarketing.net or call us at 619-972-7073. Please mention the vehicle you are inquiring about so we can respond promptly. Inspections are encouraged before any purchase, of any vehicle, anywhere.